I have officially learned how to make sushi. I think there should be some kind of gold medal awarded at the end of the night because let me tell you folks, it’s pretty tough. The seaweed wrappers are super easy to tear and they call it sticky-rice for a reason. 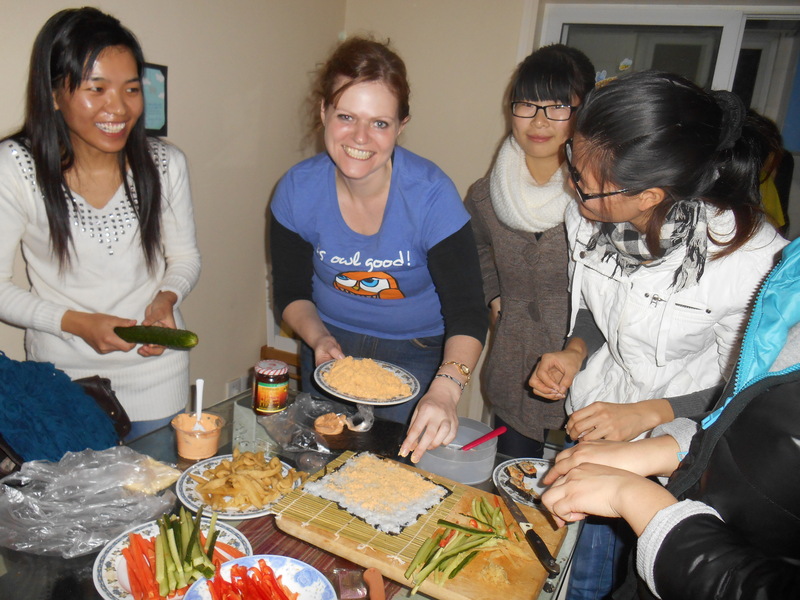 I had so much fun though and my Chinese friends had a ball teaching me how to make it. Unfortunatly I don’t have a recipe to give you because some of the ingredients they didn’t know the English names for. The basic idea though is that you can fill them with just about anything. 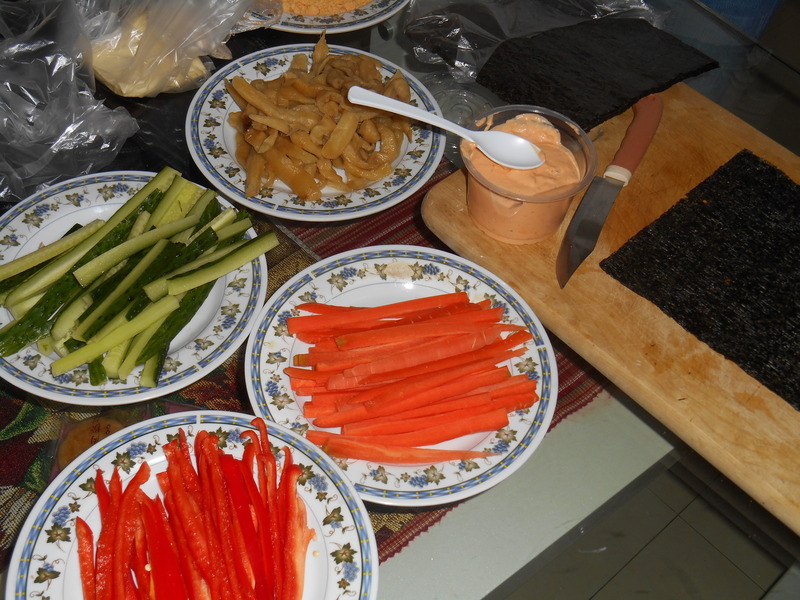 We used meat powder, thousand island dressing, cucumber, carrot, red pepper and salted turnips for ours. Since this week is Thanksgiving, I thought it would be nice to incorporate a meal along with our normal Tuesday gathering for book club. The girls were great about cleaning up after themselves in the kitchen. They did all the dishes for me, and I showed them where things go in the cabinet so they can put them away themselves next time, and they even took out the trash without being asked. I am so thankful for Good Friends and Good Food! Looks like your having a great time, just wanted to tell you Happy Thanksgiving, we miss you. Thank you so much for thinking about me. 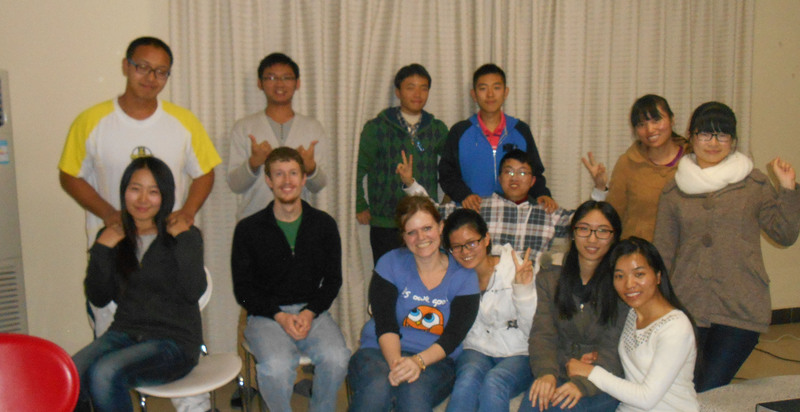 I had a great Thanksgiving today with some friends who cooked mexican food and we played games and had a great time. This weekend some other foriegn teachers and I are going to have a traditional Thanksgiving meal with all the side dishes and stuff. I’m going to make a broccoli casserole. I hope you have a really good day with your family and friends.